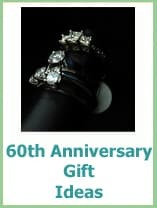 60th wedding anniversary gift ideas are traditionally diamond gifts but when two people have shared their lives for 60 years your gifts will be more personal, especially when it is your parents or grandparents. However if the celebration with diamonds cannot be missed, there are lots of stunning diamond jewelry to choose from. 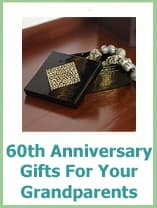 Your 60th is the original diamond anniversary! 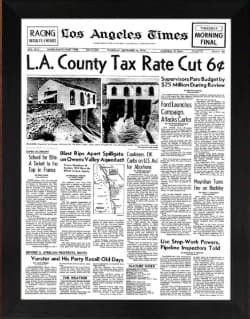 The front page of the newspaper from the day they were married in 1958 would make a great gift. And one that they can enjoy together, then frame after. Toast 60 years of married bliss with engraved toasting flutes. 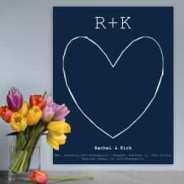 Personalized with their names and their wedding date. 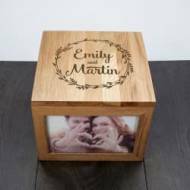 A photo box personalized with their names and their favorite photos from the past 60 years. There is space inside to fill with candy, maybe 60 Hershey kisses. This personalized Family Tree canvas shows all of you together with the 60th Anniversary couple as the start of your journey together. 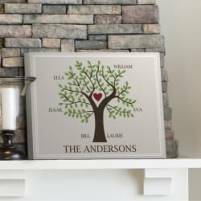 This Personalized Family Tree pillow would look great on their couch. Together with their favorite people. 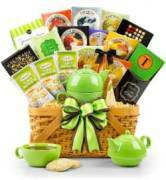 An Anniversary Keepsake Box is a treasure of memories. Personalized with their names and their Wedding Date and then filled with souvenirs from the past 60 years. 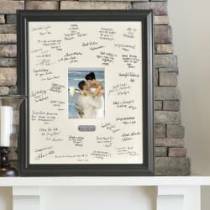 If you are having a 60th Anniversary party this frame makes a great guest book. With all of your guests leaving extra special memories. 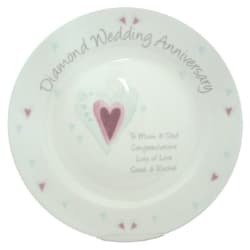 A Personalized 60th Anniversary Plate with your own Happy Anniversary message added to the plate. This would look lovely displayed at home for everyone to see. A love story that has lasted for more than 60 years is beautiful and would make a great customized canvas for their wall. Diamonds are the symbol for this Anniversary and this photo album is a sparkling reminder! 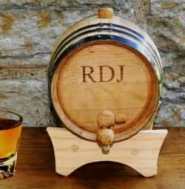 Personalized with their names and you can fill it with their favorite photos, or photos from their celebration. 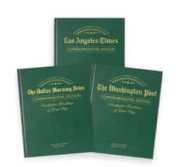 This newspaper book has copies of the front covers of the newspaper from the day that they were married and every Anniversary after. 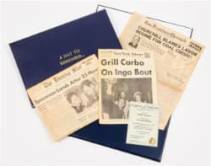 An authentic copy of the newspaper from the day they were married in 1958 gives them a real piece of History and they will have fun reading the articles from the day their Wedding Day. Bouquets of flowers can include sparkling gems on wire that look just like diamonds, plus there are a number of flowers that have been named diamond anniversary; Diamond Rose and Diamond Anniversary Marigold to name two. 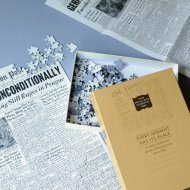 England's Queen and Prince Phillip celebrated their diamond anniversary recently and you can arrange for a congratulations telegram from the Queen, if you live in the United States then you can receive a greeting from the White House. Both you will need to apply for. How to apply for a 60th Wedding Anniversary letter from the Queen or the President. 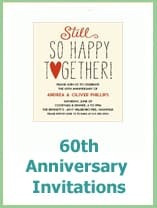 As celebrating 60 years married is all about the happy times, you could put together a small film with still photographs, set to music that you could present to them. Here is one below, for you to get ideas. If they enjoy music then you can buy compilation albums full of music from specific years or a Neil Diamond cd or even Marilyn Monroe's Diamond Collection. 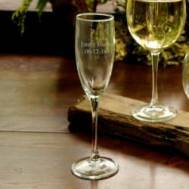 However you choose to celebrate, don't forget the Champagne, you could personalise their Champagne flutes to add to the celebrations. 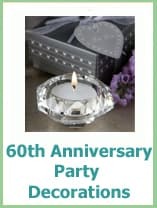 A lot of Diamond Anniversary couples find that they would prefer to have donations to their favorite charity rather than gifts, if you are having a 60th anniversary party then you could have a wishing well in the room with all donations going to charity. 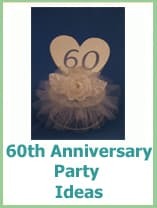 When you have been married for 60 years a party is a definate must, even if it is a small get together with family you will want to have a fun time. We have lots of ideas for your party!